I love beets! They are truly a favorite. Plus they are loaded with nutrition benefits. Specifically beets are rich in nitrates, betaine, and the B-vitamin folate; these nutrients in beets can help your health in many ways! Nitrates in your body are converted into nitric oxide which helps to relax and dilate blood vessels which in turn can boost blood flow. Betaine (a plant compound found in beets and other foods) has been shown to protect internal organs, improve vascular risk factors, and enhance performance. While folate helps to drive down levels of homocysteine in the blood, which can reduce the risk for artery damage and heart disease. 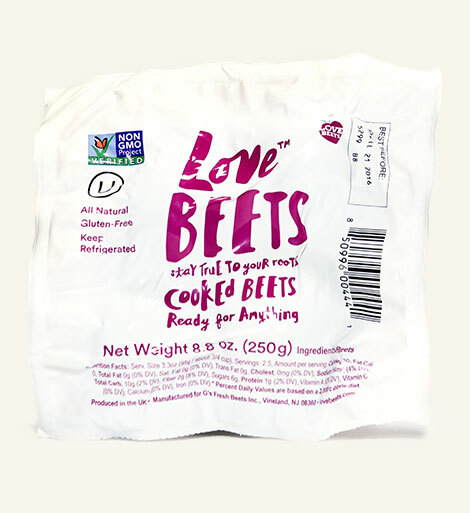 When you are short on time to peel and cook beets, Love Beets has you covered with packages of cooked, ready to eat beets (pictured above). Look for them in a refrigerated area of the produce section of the grocery store. Also look for delicious baby beets too in flavors like honey + ginger and sweet chili. Check out this delicious Greek Cucumber Beet Salad recipe (See below) and some other favorite picks like: Beet and Salmon Nicoise Salad, Strawberry Rhubarb Beet Scones, or Beet Caprese Salad with Lemon Basil Dressing. Note: This isn't a sponsored post, just products I love! 1. Add the first 8 ingredients to a mixing bowl. 2. Whisk together the remaining 5 ingredients in a bowl. 3. Pour the dressing over the vegetables and toss everything together until well-coated. Taste the salad for flavor and add more sea salt and/or vinegar to taste. Click here to visit Love Beets.com for more recipes and information.